1. Camera: True color high definition CCD camera- Exclusively for real time sorting application. Comprehensive image information used to identify tiny defects, dull colors easily at very high speed. 2. Image Processing: DSP+FPGA forefront technology – Incomparable arithmetic capability and perfect program design create solid performance throughout system. 3. LED: LED light source – Prolonged life time, Uniform lighting effect through the entire usage area, lower energy consumption. 4. HMI: Intelligent Operating System – Embedded based 7inch TFT touch screen enhanced machine safety and easy debugging. 20 types of program can be registered in memory. 5. Ejector: High Speed Serviceable Ejector- To achieve higher productivity and to reduce carryover. 6. Chute: Anodizing low Friction Chute – Dedicated designed chutes ensure flowing of different grade cashews. 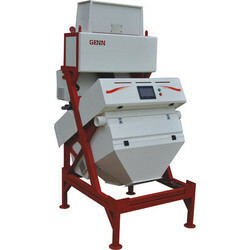 We are offering a wide range of Cashew Nut Color Sorter Machine. The offered sorter machine is manufactured using the finest quality components and advanced technology in sync with industry norms. In tune with different demands of our prestigious clients, we design this sorter machine in different designs and sizes. Moreover, this sorter machine is highly praised in the market for its different features. We offer a wide and comprehensive range of products, which include Cashew Boiler, Cashew Cutter, Cashew Peeling Machine, Cashew Dryer, Cashew Kernel Separator, Cashew Sizing Machine, Cashew Nuts and many more. We cater to different technical specifications requited by clients and provide easy to install machines which require low electricity and maintenance. We offer high-quality products, and timely delivery at very affordable prices. This approach has earned us an unparalleled niche in the market place. Moreover, our customer-centric as well as quality-focused business policies have enabled us to muster a large client-base in this competitive market. We have carved a niche amongst the most trusted names in this business, engaged in offering comprehensive range of Cashew Sorter Machine. 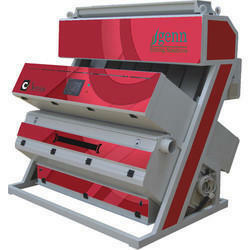 With the inclusion of advanced techniques, we are involved in offering a wide gamut of Cashew Colour Sorter Machine. 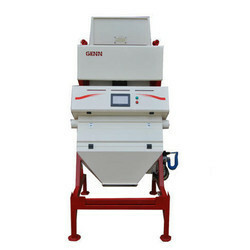 Offered color sorter is built to increase the quality of food products by removing contaminants. This color sorter is checked on numerous parameters before delivering at customer's end. As well, we provide this color sorter in various customized options to cater the exact requirements of the customers.